High concentrations of free radicals like the superoxid anion (O2-) and related reactive oxygen species (ROS) are dangerous to living organisms. In low concentrations however they are important regulatory factors. 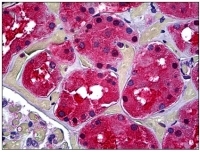 Many ROS-induced reactions protect cells from oxidative stress and restore redox homeostasis. In this “Focus On” you will find a short introduction to some selected enzymes of the redox pathways (shown below). In mammals this family of peroxidases currently counts six members, which show a variable subcellular distribution. Peroxiredoxins play a role during proliferation, differentiation and apoptosis. They have molecular weights in the range of 20 – 30 kDa. Fig. 2: Western blot analysis of PRDX3 Antibody (N-term) (Cat.-No. AP17663PU-N) in NCI-H460,MDA-MB231,HepG2 cell line lysates (35ug/lane). PRDX3 (arrow) was detected using the purified Pab.(2ug/ml). Fig. 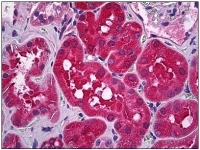 3: Immunohistochemistry of paraffin-embedded H-kidney using Cat.-No. 17724-1-AP (Prx5 Antibody) at Dilution 1:50 (under 40x lens). Thioredoxins (Trx) are small, multi-functional proteins with oxidoreductase activity and are ubiquitous in essentially all living cells. Fig. 4: Western blot analysis using Trx antibody Cat.-No. AM06168SU-N against various fusion protein with Trx tag. Fig. 5: Human Lung (formalin-fixed, paraffin-embedded) stained with TXN antibody Cat.-No. AP22618PU-N at 1/200 followed by biotinylated goat anti-rabbit IgG secondary antibody, alkaline phosphatase-streptavidin and chromogen. This family comprises oxidoreductases which are homologous to glutathione reductase. Members of the TrxR-family have molecular weights between 55-58 kDa. 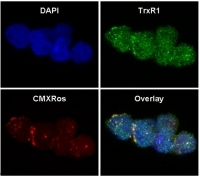 Three isoforms are known: a cytosolic TrxR1, a mitochondrial TrxR2 and TrxR3, also known as ‚thioredoxin and glutathion reductase’ (TGR). Fig. 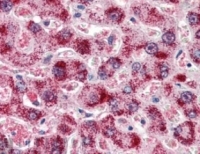 6: Immunocytochemistry: CMXRos (a mitochondrial marker; 1:8,000 dilution; Molecular Probes; red staining) was added to U937 cells growing in suspension, which were then incubated at 37°C for 30 min. Cells were fixed in paraformaldehyde and permeabilized. Cells were then incubated in blocking buffer ( 5% normal goat serum in PBS plus 0.05% Tween 20), and then in anti-TrxR1 (TrxR1; 1/100 dilution, Cat.-No AP32538PU-N, green staining). After washing, cells were incubated with an anti-Rabbit-Alexa 488 secondary antibody conjugate (1/100 dilution; Molecular Probes), washed, mounted in DAPI (blue staining) containing medium, and visualized in an Olympus IX71 confocal fluorescent microscope. Data generously provided by Ismael Samudio, Dept. of Blood and Marrow Transplantation, University of Texas M.D. Anderson Cancer Center. Fig. 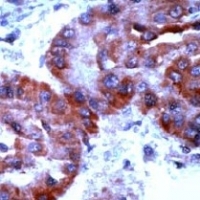 7: Liver carcinoma stained with Anti-TrxR2 antibody. Cat.-No. AP15816PU-M. These small, heat stable oxidoreductases are also known as thiol transferases. They are part of the glutaredoxin system, in which the glutathion reductase transfers electrons via glutathion from NADPH to glutaredoxin. 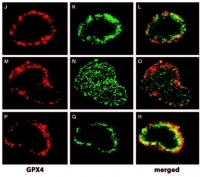 The 12 kDa dithiol-protein Grx plays a role in disulfid-reduction in cells exposed to oxidative stress. Fig. 8: Confocal immunofluorescent analysis of GPX4 Antibody (Center) Cat.-No. AP51940PU-N with HepG2 cell followed by Alexa Fluor 488-conjugated goat anti-rabbit lgG (green). 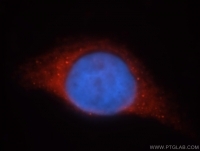 DAPI was used to stain the cell nuclear (blue). Fig. 9: Glutathione peroxidase 4 / GPX4. Cat.-No. H00051022-B01P. Glutathione Peroxidase is a 92 kDa protein consisting of four identical 23k Da subunits. Its function is the protection of cell surfaces and extracellular fluid components from oxidative damage by catalyzing the reduction of peroxidases and organic hydroperoxidases. Fig. 10: Confocal immunofluorescent analysis of GPX4 Antibody (Center) Cat.-No. 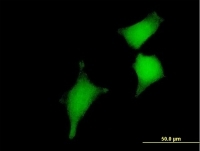 AP51940PU-N with HepG2 cell followed by Alexa Fluor 488-conjugated goat anti-rabbit lgG (green). DAPI was used to stain the cell nuclear (blue). Fig. 11: Glutathione peroxidase 4 / GPX4. Cat.-No. AP55263SU-N.
GR is a cytoplasmic flavoenzyme widely distributed in aerobic organisms. The dimeric protein is composed of two identical subunits, each containing 1 FAD and 1 redox-active disulfide/dithiol as components of the catalytic apparatus. It plays a role in maintaining glutathione (GSH) in its reduced form by catalyzing the reduction of glutathione disulfide (GSSG). Fig. 12: Confocal immunofluorescent analysis of Glutathione reductase Antibody (C-term) Cat.-No. 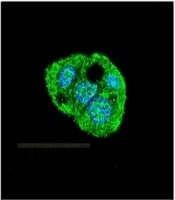 AP51963PU-N with NCI-H460 cell followed by Alexa Fluor 488-conjugated goat anti-rabbit lgG (green). 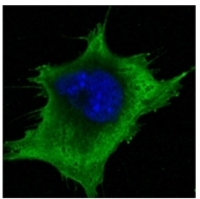 DAPI was used to stain the cell nuclear (blue). Fig. 13: Immunofluorescent analysis of MCF-7 cells, using GSR antibody 18257-1-AP at 1:25 dilution and Rhodamine-labeled goat anti-rabbit IgG (red).Blue pseudocolor = DAPI (fluorescent DNA dye). Cat.-No. 18257-1-AP. Fig. 14: Mn SOD visualized using Cat.-No. AP03023PU, tested on Bouin's fixed paraffin-embedded backskin sections of transgenic mice. Courtesy of Dr. Turksen, Ottawa Hospital Research Institute, Canada. Fig. 15: Confocal immunofluorescence analysis of 3T3-L1 cells using SOD1 antibody Cat.-No. AM06340SU-N (green). Blue: DRAQ5 fluorescent DNA dye. 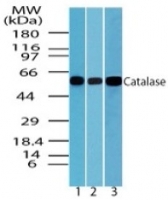 Catalase is a homotetrameric heme-containing enzyme present within the matrix of all peroxisomes. It carries out a dismutation reaction in which hydrogen peroxide is converted to water and oxygen. Fig. 16: AP16501PU-N Catalase antibody staining of Paraffin Embedded Human Liver at 2 µg/ml. Steamed antigen retrieval with citrate buffer pH 6, AP-staining. Fig. 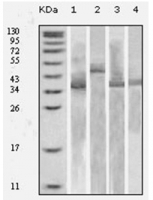 17: Western blot analysis of Catalase in liver lysate of 1) human 2) mouse and 3) rat using AP21666PU-N at 0.1 µg/ml. MsrA reduces methionine sulfoxide (MetO) residues in proteins and free MetO to Methionine (Met). The catalytic activity of MsrA is dependent of bound metal and cofactors but it requires reducing equivalents from either DTT or a thioredoxin-regenerating system. MsrA plays an essential role in protecting cells against oxidative damage. Fig. 18: Immunohistochemistry of paraffin-embedded Skin Cancer using 14547-1-AP(MSRA Antibody) at Dilution 1:50 (under 10x lens). Cat.-No. 14547-1-AP. Fig. 19: Human Kidney, Tubules: Formalin-Fixed, Paraffin-Embedded (FFPE). Cat.-No. AP31425PU-N.
OriGene Technologies offers a full panel of antibodies for the detection of different proteins of redox pathways. These antibodies can be used in various immunological methods such as Western blotting, ELISA or immunoprecipitation.